A stress hormone modulates compulsive biting in a rat model of self-injurious behavior (SIB), according to new research published in JNeurosci. Manipulating the activity of the brain circuitry underlying SIB could create new possibilities for treating this symptom of stress and neuropsychiatric disorders. The globus pallidus, a part of the basal ganglia, has a well-known function in the regulation of movement. It has also been implicated in stress-related emotional disorders frequently accompanied by SIB, such as depression and obsessive-compulsive disorder. 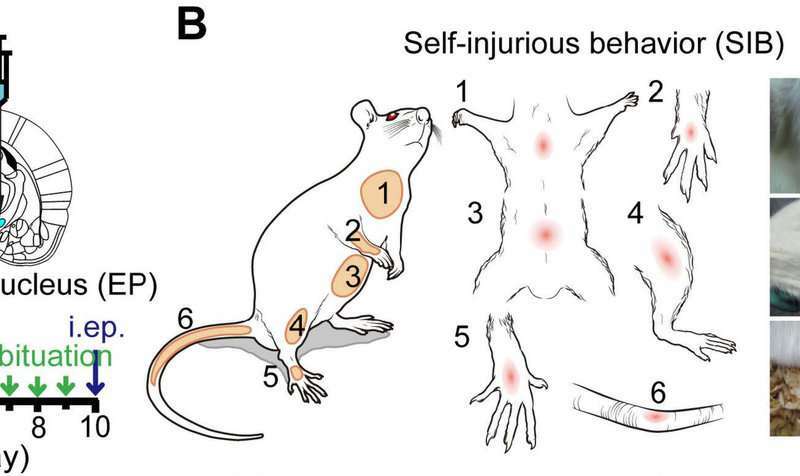 Pak-Ming Lau, Lin Xu and colleagues investigated SIB in rats by disrupting activity in a similar brain structure called the entopeduncular nucleus, which led to self-inflicted bite wounds. The researchers identified many brain regions involved in SIB, including two areas involved in the processing of stress and reward: the lateral habenula and the ventral tegmental area. They demonstrate control over this behavior by manipulating activity of these two regions as well as levels of the stress hormone corticosterone. Self-biting could not be fully blocked, however, suggesting additional pathways to be explored in future studies of SIB.